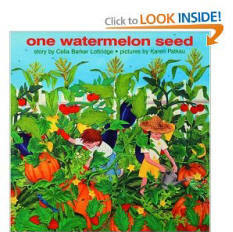 This is the story of Max and Josephine as they plant, grow, and harvest their crops. The storyline teaches kids about gardening and its connection to the changing seasons. I enjoyed the packed and detailed illustrations, and I think your child will want to take the time just to take it all in. As for the math, this book gets into counting in a serious way. It doesn’t just take your child from 1 to 10, but it goes all the way up to 100! So Lottridge’s book is good for children from kindergarten through second grade. Younger children will learn the lower numbers, and enjoy the pictures and the story even if they don’t comprehend all of the numbers. Older children will get a review of the basics and then be introduced to the concept of counting in groups of ten, which is good preparation for learning multiplication. Designing a garden plan for various plants.. What things do you need to do to help the plants grow strong? How would you design a habituate for growing plants in the winter or cold weather? Want to take this book to the next level? There are lots of interactive activities that you can explore with your students using Lottridge’s book as a jumping off point. One option is for your students to choose his/her favorite plant from the story and research it. How long is the growing season and when is the time to harvest? What is the usual yield and how does it compare to the amounts in the book? What are the largest and smallest specimens ever recorded? You can start a small garden of your own, even if it is just a couple of plants in a pot. The students can enjoy watching their garden grow through the summer, and they will learn how important it is to remembers to take care of it! When it’s ready to harvest, find a cool recipe and help your students make it. If you are reading to a group of children, you can survey the kids about which plant is their favorite. Graph the results and talk about different ways you can present the information.